Boris has lost most of its deep convection and is weakening rapidly. It still looks very impressive on the visible satellite imagery. 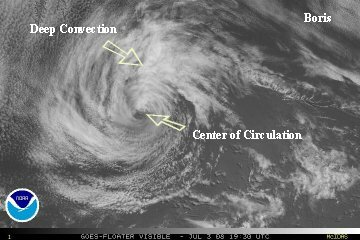 It is no wonder that Boris become a hurricane with such a well defined and massive circulation. This will be our last update on Boris unless it regenerates or will effect the Hawaiin Islands in some fashion. The circulation should continue to degenerate over the cooler water.